Pomegranate has been a trendy fruit juice but it's been a long standing and common juice among Mediterranean countries. Lebanese and Persian ethnic grocery stores often have pomegranate juices and syrups available, which are used in both sweet and savory applications. For my Labor Day Mediterranean inspired dinner, I wanted to incorporate pomegranate into my menu for cocktails. Similar to sangria, this Pomegranate Sparkler is a cocktail that combines pomegranate and Prosecco, an Italian sparkling wine. I found it to be a refreshing drink with a nice tang from the pomegranate and the refreshing sweetness from the Prosecco. Another cocktail I made with Prosecco is my Orange Peach Cooler. This combines fresh squeezed Minneola orange juice (which was left over from the recent mimosas I made) and peach nectar. If you're looking for a way to use those sweet peaches currently in season, add slices to this! Again, this was a great cocktail my guests enjoyed and it also added some nice color to my drink selections. Joining my pomegranate sparkler and orange peach cooler above is my Watermelon & Mint Sangria which sits in the middle of the two. Combine the prosecco and juice in your serving pitcher and add ice to chill. Combine the prosecco, orange juice and peach nectar in your serving pitcher and add ice to chill. i love proseco drinks. looks wonderful! These look great! It never really gets cold here in Florida so I will be making these soon I am sure! 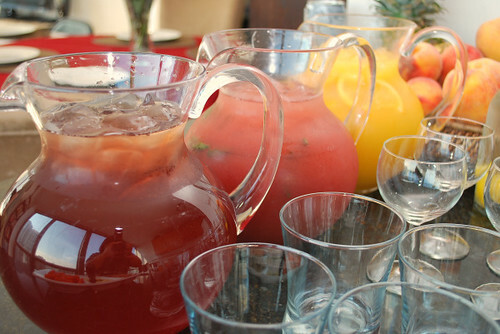 I love to have lots of refreshing drinks ready for when friends come over! Prosecco really does make any drink special! Thanks for these great drink ideas. POM just sent me a case of juice... I just might be making that POM & Prosecco this weekend! Oh, that Orange Peach Cooler sounds super yummy. these look so refreshing. i can't wait until i can have them next spring. bookmarked!